Deacon José was ordained a deacon at Our Lady of the Pillar Church in Santa Ana, California, on Saturday, July 29, 2017, by His Excellency Kevin Vann. Many fellow Recollects, religious and lay, attended the celebration. The volunteers of the parish provided a delicious lunch in the parish hall following the Mass of Ordination. Deacon José is very excited about his new ministry as an Augustinian Recollect and commitment to the service of God's people. He will remain in ministry at Pillar until August 8 and then travel to visit the province's east coast houses of Tagaste Monastery in Suffern, NY and the provincial residence in West Orange, New Jersey. Deacon José will return to Las Rozas, Madrid, Spain, on August 23, to start his final year of theology in preparation for, God willing, next year's ordination as an Augustinian Recollect priest! Congratulations, Deacon José! May Almighty God bless you abundantly! Fr. 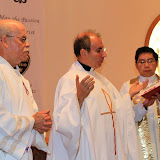 John Michael Rafferty, OAR, Prior Provincial of Saint Augustine Province and the newly ordained, Deacon José Arredondo Vázquez, OAR. In the midst of a very rainy week the sun was shining very nicely on Wednesday, May 24, for the 20th Annual Tagaste Golf Outing held at Spook Rock Golf Course in Suffern, NY, and sponsored by the Golf Committee and the Pius X Guild of Tagaste. A great deal of credit goes to Mr. Greg Hayden and the other members of the committee who met and worked tirelessly since the beginning of the year to recruit golfers and sponsors for the event as well as to organize the activities of the day. Some 115 golfers participated, enjoying a noon lunch followed by a 1:00 pm shotgun start. After a full afternoon of golf there was a cocktail hour followed by dinner and an awards presentation at the Spook Rock Chalet. There was also a silent auction and a 50/50. Special appreciation plaques were presented to Margaret Evans, president emeritus of the Pius X Guild, and Rita Gannon, secretary of Tagaste, for their outstanding support of the Outing over the years. Fr. John Gruben, OAR, prior of Tagaste, welcomed all of the golfers and gave the table blessing to begin the dinner; Fr. Fidel Hernández presented a slideshow with photos of all the candidates who were helped by the scholarship fund since its beginning in 1997 as well as a short video in which Fra. José Arredondo, recipient of this year’s scholarship award, offered words of thanks from our house of formation in Madrid. By a happy coincidence, Fr. Michael Rafferty, prior provincial, and Fredric Abiera, province secretary, who were present for the event, were celebrating their 14th anniversary of priestly ordination. The Golf Outing has become the biggest and most successful fund raising activity of the year for Tagaste and has contributed substantially to the education of our candidates to become Augustinian Recollect priests and brothers. Fray José Arredondo, recipient of this year's scholarship.